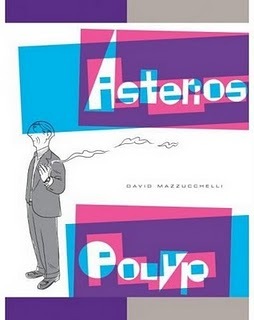 This is part 4 of ASTERIOS POLYP annotations. Naturally, spoilers follow. Click here for part 1, here for part 2, and here for part 3. Got your copy of the book handy? Good. Let 's go. Page 2, Panel 6: The idea of using negative space, or using the space around an image, is very big in Japanese culture. For example, there was a method of counting created by the Japanese that had a base of eight instead of ten, because they counted the space between the fingers instead of the fingers themselves. Panel 7: Asterios commends Hana on the lesson, but you know he doesn't really mean it — he's probably just into the whole "dual" visual. Page 3, Panel 3: Asterios lacks a good bit of self-awareness. Page 4, Panel 6: So does Willy. Page 5: If anyone gets the significance of Kalvin Kohoutek's name, I'd appreciate it. "The gutters between panels mark these divisions and give comics what comedians call timing, actors call beats and musicians call rhythm. 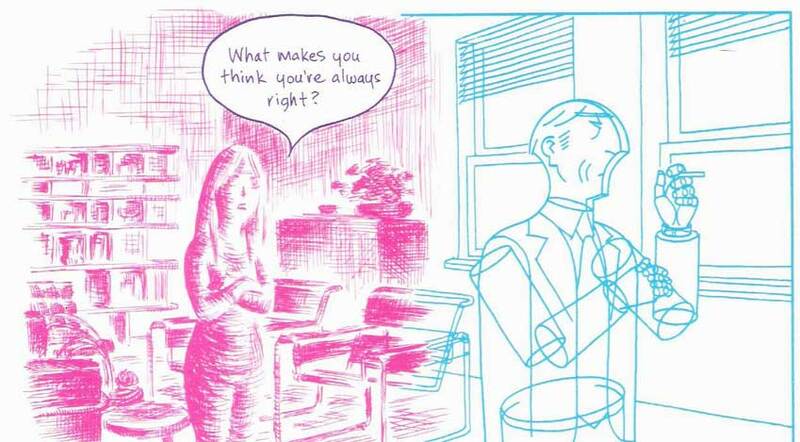 We can almost feel these silent beats as our eyes alight on panel after panel and read the character's body language. This visual rhythm is most noticeable in wordless comics, but if we ignore any captions or word balloons and scan the pictures only, we can still feel the pulse. 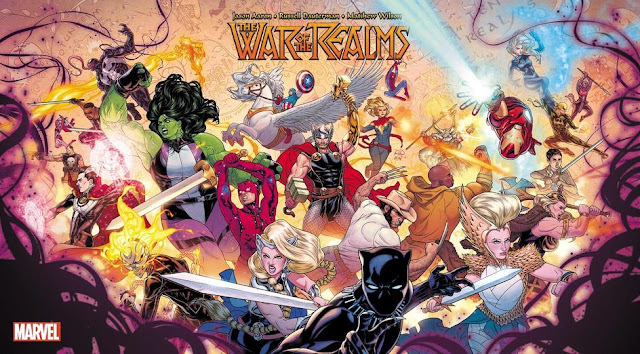 When we do read the words their sound plays off this background rhythm and creates a kind of melody, and the degree to which the two are consonant or dissonant makes for a kind of synaesthetic harmony, what we might call the music of comics." Panel 6: "Fearsighted" and "bohegeois." It seems Kalvin really like portmanteaus. Panel 7: "Gregg Shorthand" is a system, also known simply as "shorthand," which was a quick way of writing and was all but required learning in America until just a few decades ago. 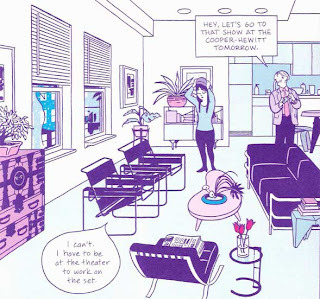 Page 13, Panel 1: We once again see Asterios' apartment from the same exact angle from which we always see it. Panel 2: If you notice, this is the same angle as the first panel in which we meet Hana, back in the last panel of Chapter 4. And in fact, this is, as we learn on the next page, the same scene. 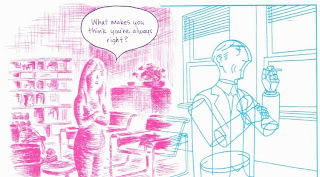 Page 14, Panel 5: As you can see, they haven't changed positions since panel 2 of the previous page, so it makes sense that the angles are the same as the last panel of Chapter 4. Page 15, Panel 2: The Selma to Montgomery marches were Civil Rights Protests in 1965. Page 1–Page 4: This is just one gigantic exhibition of masterful storytelling. Page 8: It's incredibly intelligent that the center of the page in this chapter that's all about how Asterios remembers Hana is the Swiss army knife that Asterios associates with Hana. On a side note, I think it's really telling and wonderful that Asterios, who so eagerly corrected his wife all the time, can think mostly of her imperfections. 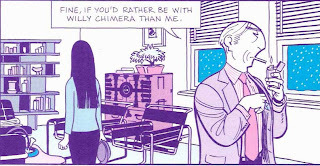 This entire chapter recreates the story of Orpheus, where Asterios plays Orpheus. Note how his harp uses architectural tools. Page 1, Panel 2: This is Cebrerus, the three-headed dog guarding the way to the Underworld (and was slain by Heracles, which you can see here). Panel 5: The subway is the way to the Underworld. That seems kind of fitting. Page 3, Panel 4: Here comes the train to the Underworld, in the water, because in Greek mythology, it's supposed to be a boat. Cover: The one-eyed Jack literally is the playing card shown here. It seems that they've changed their name from the "Radniks" to the "Rudnicks" as well, though I don't know what it could mean. Page 6, Panel 6: Despite all his growth, it's hard to snap out of bad habits. Panel 7: "The crack of time." Stiffly screws up both "the crack of dawn" and "the dawn of time." Page 7, Panel 1: Stiffly screws a cliche up again, and Asterios decides to contribute. Panel 7: Asterios is dumbfounded by a philosophy that has to do with three things. Polyphemus was a cyclops of Greek myth, and we know that the Polyp family immigrated and that their name was "cut in half" by an immigration officer. Their family name could well by "Polyphemus", especially when you consider that Polyp is exactly half of that word. Remember how, later on in the story, Asterios loses an eye at One-Eyed Jack's, turning him into a cyclops? This seems significant. Thanks for that insight, Ruby! B-b-but Darrell, that can't be true. I like Kirby, and according to random dudes on the intrawebz, Kirby's a hack! I know, and he was such a meanie that would allow inkers to mangle his work (Colleta erasing backgrounds) because he didn't want to put ANYONE out of work. I would post this there, but I have a feeling it would be akin to showing a dog a card trick. Seriously, man. Some people -- I just don't get it. Hi, great annotations so far. Very interesting to reread the book that way. Thank you! That's an excellent point!